Specialized Trauma Counselling Services for survivors and victims of sexualized violence. Support and navigation for survivors and victims of sexualized violence. We strive to be as accessible, reaching women and girls throughout the Tri-Counties by offering programs and services, satellite offices, a toll free number and a primary location in Yarmouth. By providing the tools to intervene in crisis situations that women and girls face, we are able to relieve poverty and other barriers in their lives: we are here to offer women and girls our assistance as they move forward in achieving their educational, work, and life goals. 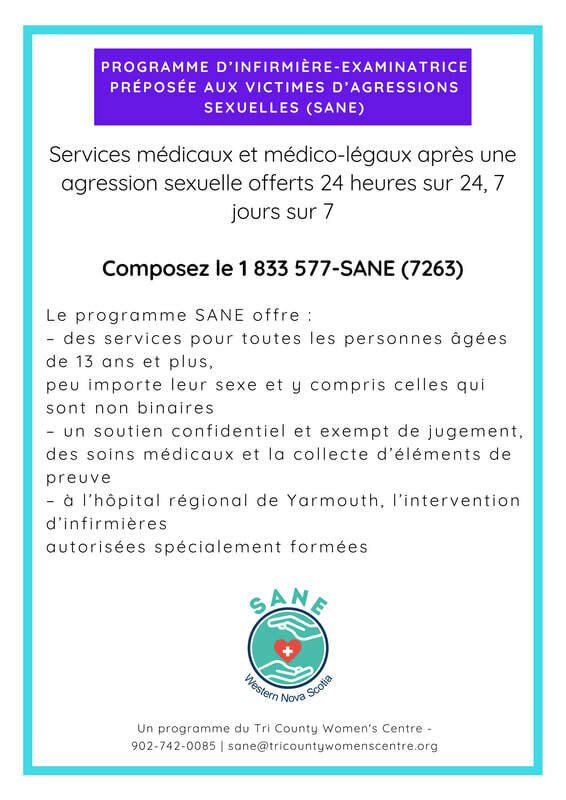 Sexual Assault Nurse Examiner Program now available at Yarmouth Regional Hospital! Thank you, Shoppers Drug Mart! Since 2002, each Shoppers Drug Mart location has participated annually in a community health celebration called Growing Women's Health (formerly Tree of Life). This year the Digby store team has chosen The Tri County Women's Centre- Digby Outreach Office as its 2017 Growing Women's Health beneficiary. This organization depends on the support of all of us to continue to serve our community and improve the quality of community based women's health. Shoppers Drug Mart believes that when Canadian women are healthy and well, Canada is healthy and well. Funds from this program are used to develop and offer programming specifically for women to assist with their health and well being, including a healthy cooking program for women on low income budgets in Digby. Along with raising money in the store, people are able to donate on-line by visiting the Growing Women's Health website. The Women's Centre would like to thank the Shoppers Drug Mart in Digby for their ongoing support! Keep up to date about TCWC programs and events!